Inside: Kid’s room organization is so much easier in a clutter free space, but we’ve got to teach them to declutter first. 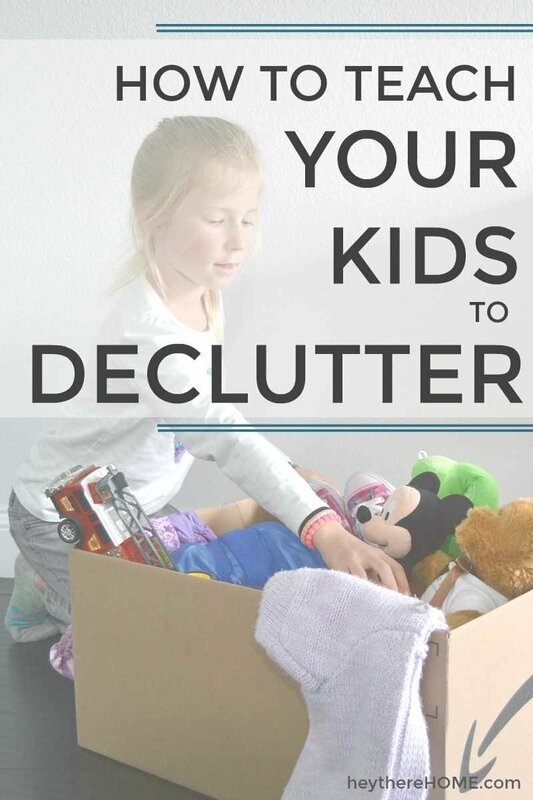 These tips will help you teach your kids how to declutter. For the past year I’ve been on a mission to decrapify our house. We’ve been here for almost 8 years and have had two kids in that time so you can imagine that there’ve been a lot of different things that we’ve needed in all of those different stages of the kid’s lives. My daughter is nearing eight and the time it would take that child to “clean” up her room was crazy. And when she was done you literally still could not see the top of her dresser because well, like many 7 year olds, she’s a collector – of everything. Cleaning her room had turned into stuffing things where ever she could and so yes, the floor was clear, but it had been way too long since we’d gone through everything. I knew how my own decluttering habit made me feel so much better in our home and wanted to start teaching her how to keep her own room clutter free so she could enjoy it! What happened were two very big things. She admitted that she’s a “stuffer“ (her word, not mine), and now every time she has to clean up her room she tells me how it takes so much less time cause there’s less stuff and she knows where everything goes. I’ve also noticed that she plays in her room more and has kept it pretty tidy on her own because she’s proud of herself. That’s the exact thing I was going for. So how did I get her and her 5 year old brother to declutter and get both kid’s rooms organized and under control? Well, we spent one entire day in each of their rooms and went through everything one tiny bin, old shoe box, and drawer at a time and decided what to keep, what to donate, what was trash. I was blown away at how successful we were and definitely want to share what worked for us so you can start teaching your kids to declutter too! 1 | Talk to your kids about the power of their donations. Kid’s are naturally very empathetic. They understand how getting a new toy or a new outfit makes them feel happy and excited. What they don’t always realize is that there are some kids who don’t often get the opportunity to experience these feelings because of their circumstances. Talking to my kids openly and often about how different life is for different people, not only makes them more appreciative of what they have, but also provides them the opportunity to show they care by donating the toys that they’ve outgrown. –And bonus, I think it makes them take better care of their toys knowing that another kid will be playing with it when they’re done. When we’re going through their toys and they come across a toy that they haven’t played with in a long time but are having trouble letting go of, we talk about how happy they were when they first got the toy and how much fun they’ve had playing with it and how amazing it would be for another kid to get to be that happy. Often that’s the push they need to let it go. Of course there are times that they truly aren’t ready to let it go, so we visit it again next time. 2 | Teach them the two questions they need to ask themselves about each item. For us adults letting go of our things can be really difficult because we attach meaning to lots of things but for kids to know if they’re ready to let go of something, is much more simple. It really comes down to these two questions. Do you use it or play with it? 3 | Provide a place for everything. We’ve made a habit of having boxes, bins, and containers for the kids toys. This keeps the toys organized and all the pieces and like items together so that when they’re getting something out to play with, all of the parts and pieces are there. It makes playing so much more fun. It also helps with the decluttering because the rule is, if it doesn’t fit, you need to purge more! For example, my son loves stuffed animals (I know, they’re the worst.) And when we’re going through them he’ll literally tell me that he loves every. single. one of them. —Which actually may be true because each one has a name and everything. But we keep his stuffed animals in a big basket in his closet and if the ones he’s keeping don’t fit in the basket, he needs to decide which ones to let go of. This idea is at the core of the mental shift I’ve had to teach myself as an adult and that is: if everything is special, than nothing really is. So paring it down to the most special, meaningful, or the stuffed animals he loves the most forces him to really think about what he values about each one and make some tough decisions — which I’m hoping sets him up for a clutter free life as he grows up. My daughter loves to collect sea shells. But we live near the beach and camp at the beach all the time so you can imagine how many shells we might have if she kept every single shell she liked –right? One jar that she keeps in her closet solves the problem because she can’t have more than that. It’s forced her to only bring home one or two favorites when we go to the beach and get rid of the “not as special as she originally thought” ones in her jar to make room for those really awesome, once in while finds. 4 | Provide a bin in the closet for clothes they’ve outgrown. One, when I see a drawer full of pants I assume I don’t need to buy new pants for them. The solution has been to provide a spot where the clothes that no longer fit go. In my daughter’s room this is a small plastic bin in her closet and in my son’s room his go on a specific shelf in his closet. When the shelf or the bin get full, I box them up and give them to our hand-me-down people or donate them. 5 | Get the kids involved when deciding where to donate. Most of these you can find by just googling places in your area. I usually search “best places to donate used toys + city.” Many of them often have wish lists posted on their websites! children’s homes – where kids go when their waiting to be reunited with family memebers or awaiting foster care placement. When I take the donations to these places the kids usually come with me and we talk about how the things we’re donating are going to benefit the people we’re giving them to. I have to say that I used to dread going through the toys and sorting everything out, but now that I’m involving the kids it is a lot of fun because instead of it being a dreaded chore, it’s turned into a family project that will serve others. I’d love to hear any other ideas you might have about where to donate previously loved kid’s toys and clothing in the comments below! Corey, love Jim’s and your parenting skills and philosophy. You’re doing a wonderful job. I don’t have kids but I read this post anyway. I think it’s just wonderful and great advise. And how you are working with the kids just sounds like you are a wonderful mother. Cyndi, thank you for those sweet words of encouragement. Glad you found the post helpful! When dealing with kids please keep in mind that as they grow their interests will naturally expand. This may just look like “more toys” but it is also a learning experience. One of the most memorable comments from my young son during a house cleaning was “please don’t throw all my memories away”. Wonderful point, Bill. Appreciate your wise input! >One of the most memorable comments from my young son during a house cleaning was “please don’t throw all my memories away”. Wow… I’ll definitely remember this the next time my kids and I are doing some decluttering, because you’re so right – it’s easy when you’re an adult to look at something that’s important to them as “just some junky toy”. Thanks Bill.